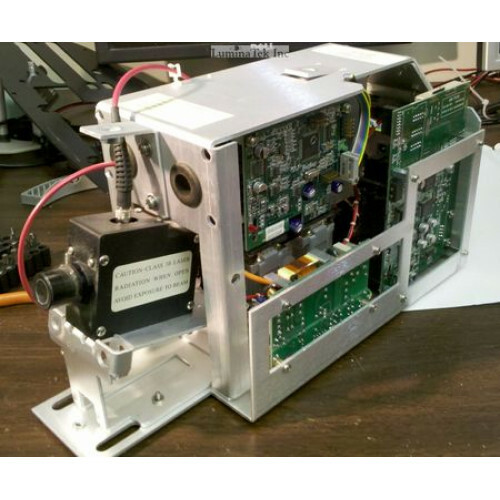 This spectrometer is a surplus item for sale, but it has been tested for "power on" test. Blue laser beam comes on and the spectrometers starts up in a normal way. B&W Tech fiber optic input spectrometer without TE cooling. Internal baffles will have to be removed to get the full spectrometer range, serial port output. OD6025-05HB 5V ball bearing fan. Two optical fibers with SMD connectors. Laser, 473nm blue with at least 0.5mW output (laser diode pumped with a 2.5W, 808nm internal laser diode). Optical beamsplitter with assembly with lenses, beam splitter, fiber couplings. This is the best present to someone who is in to optics and analytical equipment. All mentioned above parts has many useful internal parts inside. For example the laser assembly has lots of lenses, few Peltie coolers and very expensive frequency doublers. The assembly is framed in aluminum sturdy cage. Originally it was very expensive caratenoid measurement Raman spectrometer. It still is, but no original software or drivers. This item has been sought for many different laser/optical spectrometer enthusiast and it has been reversed engineered for usefull applications. We are selling it as a hardware without software support. We do have very basic software for the CCD spectrometer part, but not as a whole unit. Please read more in our forum.